1. For the caramelised pecans, heat the maple syrup in a small frying pan with the nuts until the syrup has been absorbed by the nuts (about 1-2 minutes). Stir in the salt and tip onto some non-stick baking parchment. Leave to cool and crisp before roughly chopping. 2. In a food processor, blitz the oats until fine, tip into a bowl and add the bananas, mashing with a fork to break down. Add the egg, baking powder and cinnamon. Keep mashing until nearly smooth. 3. Heat a knob of butter in a non-stick frying pan and fry the pancakes 2 tablespoons of batter at a time, until golden on each side and risen (about a minute on each side over a medium heat). Cook in batches adding extra butter as required. 4. 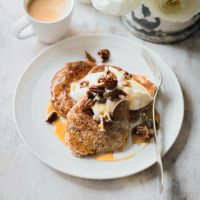 Serve the pancakes with a dollop of yogurt, a sprinkle of the caramelised pecans and drizzled with extra maple syrup.